Too much nutrition advice contains information like 64mg of Sodium Potassium Chloride twice every 6.5 hours with still water out of a recycled cup. The focus of my ideal diet is performance. Mental performance and physical performance. Foods these days have been over-engineered for taste, sacrificing performance. Short-term mouth pleasures to keep you eating more. My whole diet can be summed up in seven words. Eat food, mostly plants, not too much. I stole this from Michael Pollan. His book Food Rules is the best book I’ve ever read on food. We’ll treat these as the pillars. But the key is the definition of food. Food, in this case, is whole foods. Foods which your great great grandparents would recognise as food. This rules out most of the refined food sources you find the Standard American Diet (aptly abbreviated as S.A.D because it will make you sad). This colourless combination of carbohydrates and fats has only been introduced to our diets in the last few decades. And it’s causing havoc to our health. Processed carbohydrates, sugars, vegetable/seed oils, fried foods. All the things you see at stores in the bright packaging or at the restaurants with the neon lights. Gone. This isn’t to say carbohydrates, sugars and oils are completely avoided. My ideal diet still contains these things but in the form of fruits, vegetables and non-vegetable/seed oils (olive, coconut). Meat is there too. Preferably from animals who also don’t eat these kinds of foods. Grass-fed & free range where possible. My primary goals are mental and physical performance. The body works very efficiently off of these kinds of foods. Have you ever ate a heavy meal of burger and fries and felt sluggish after? I’m avoiding this feeling at all cost. Plus, add up enough of these feelings and you’ve got yourself a longer-term health problem worse than just feeling sluggish. The best foods don’t require packaging. Vegetarian diets and vegan diets work great. All diet trends work great. All the diet trends you’ve heard of work because they follow a common trend. They avoid the S.A.D (Standard American Diet). Whether it be completely plant-based, a combination of plants and animals or completely meat-based, they focus on whole foods. Mostly plants is me trying to take care of my microbiome. It’s the colony of bacteria which live in your gut. There are more of them than us, 10 times more. 10 times more bacteria cells in your whole body than your own cells. We still don’t know the exact role the microbiome plays in day to day life but more and more research is pointing towards it being considered as the second brain. Even if you based the significance of importance on cell numbers alone, your microbiome is something you should be concerned about. There was an experiment done on sets of twins. Genetically, twins are the same. They have the same DNA. Except for these sets of twins, one of them was overweight and the other wasn’t. If their DNA is the same, what was the difference? The twin which was overweight had a less diverse microbiome. 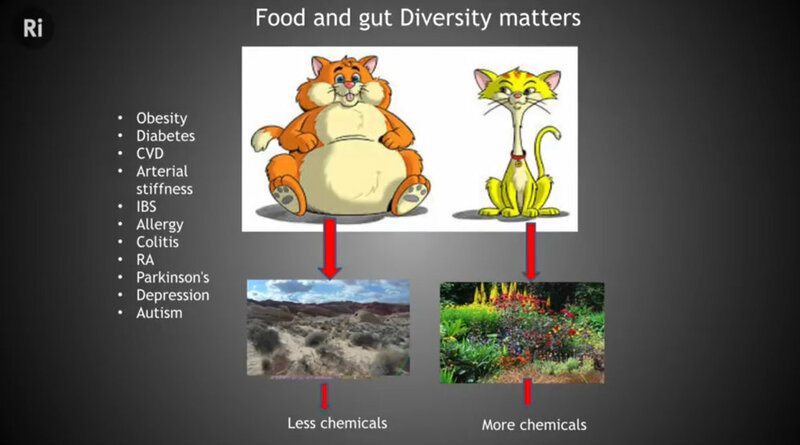 Outtake from The Royal Institution Talk: What Role Does our Microbiome Play in a Healthy Diet? Their microbiome. The twin who was overweight had a less diverse microbiome than the other. This is was the case for all the twins in the study. Less diverse means there were fewer species of bacteria. The overweight twins microbiome was like walking through a garden with only one type of plant. And the other twin had a microbiome like a rich English Garden. Keep your microbiome looking like a rich English garden. Outtake from The Royal Institution Talk: What Role Does our Microbiome Play in a Healthy Diet? How would you improve the garden with only one kind of plant? This is the same as the microbiome. Adding more plants, more fruits and vegetables, diverse kinds of leaves, fermented foods (foods with bacteria already in them) help to diversify the microbiome. My ideal diet takes care of my bacteria cells and my own cells. Have you ever seen a person walking through an airport trying to carry too many bags? It doesn’t look like a good time. Eating too much is the same as trying to carry around more bags than you need. If I’m trying to balance all those extra bags and perform physically and mentally at the same time, it isn’t going to end well. How do you know how much? One way is to meticulously plan out what you’re going to do. Like planning a trip day by day, hour by hour and packing every single thing you need. Eating like this works but it’s hard work. Tracking every calorie, adding food here, removing it there. I won’t be able to perform physically and mentally if all I’m doing is trying to calculate the perfect amount to eat. Imagine your body is a car tunnel. Except the car tunnel has a smaller exit than entrance. What happens to the car tunnel when cars keep coming in faster than they go out? It’s hard for the car tunnel to do what it’s meant to do when it’s clogged. The same goes for the body. If I’m always in the state of trying to process food, eating every couple of hours, I won’t be able to perform how I want to perform. How does a car tunnel get cleaned? It shuts off for half a day. Maybe a whole day sometimes. The same goes for the body. Eating when you’re hungry instead of in between lets it get on with the other things it has to do. My car tunnel shuts down for maintenance from 8 pm - 12 pm every day. Like packing for the airport. I only pack what’s required. What works for one person might not work for someone else. But when it comes to health, don’t look for the overcomplicated solution. Try a few things and see what works for you. My ideal diet is a perpetual experiment with the goal of finding what helps me perform better physically and mentally over the long term. Eat food. Not too much. Mostly plants. Not too often.